At the U.S. Military Academy (USMA) at West Point, north of New York City, there are values instilled in cadets that revolve around "Duty, Honor, Country." Dr. Fritz Kraemer, a WWII Army officer and later one of the greatest Pentagon strategists, adopted that motto as his own. Armed with it as his moral code, he mentored Dr. Henry Kissinger and General Alexander Haig, each of whom went on to become U.S. Secretary of State, and he profoundly influenced Dr. Hubertus Hoffmann — founder of World Security Network. Such a moral code remains timeless, and at a recent gathering at West Point, Dr. Hoffmann shared with cadets and members of the faculty how it can influence "fresh and better" foreign and defense policy. Noted Hoffmann, "The current foreign policy is predominantly passive, dominated by talking and not doing. We adapt to negative reality in little slices instead of actively shaping it in a pre-emptive positive way. Thus, we lose influence and do not support the forces of freedom with deeds but just empty words, as in the "Arabellion." Dr. Hoffmann visited West Point to share knowledge gained from Fritz Kraemer, who preferred to be addressed as "Colonel" rather than "Dr." The colonel saw himself as a missionary of freedom and a mentor to young, unknown talents with the potential to assume important roles in their respective countries as a new "responsibility-elite." The legacy of Dr. Fritz Kraemer and his concepts are laid out in the new book: True Keeper of the Holy Flame. The Legacy of Pentagon Strategist and Mentor Dr. Fritz Kraemer (order via www.worldsecuritynetwork.com/fritzkraemer), by Dr. Hoffman. In it, the author describes how "passion and a Holy Flame" are necessary in foreign affairs, similar to Steve Jobs describing the basis for his success founding Apple. Said Hoffmann, "The West understands how to market iPhones, Porsches and Gucci but not its own values and foreign policy." He also cited Albert Einstein: "Imagination is more important than knowledge ... We cannot solve the problems on the same level of thinking on which we created them." 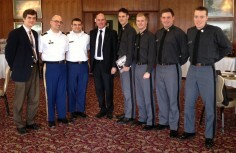 The gathering of minds at USMA was orchestrated by Brigadier General (ret.) Michael J. Meese, formerly The Professor and Head of Department of Social Sciences at the academy, which is based along the banks of the beautiful Hudson River where George Washington, one of America's founding father, once fought the American Revolution. Meese said that Dr. Hoffmann enlightened faculty and cadets on Kraemer's policy-shaping ideas that can be employed in new eras of diplomacy: "Dr. Kraemer's time in WWII taught him strategy. Then he took truths and values and turned them into power. Combined with critical thinking, it provided him clear views on how to shape U.S. national security policy." Kraemer also never fell prey to "provocative weakness" in the face of fanatics. In his view, displaying weakness can aggravate tenuous situations and lead to war. Diplomacy, therefore, is impossible without the power to back it up. General Haig saw the makings of these visions as a cadet in his early years. It was later at West Point that Kraemer re-discovered then-Lt. Colonel Haig, who earlier impressed him in the Pentagon as a major on the NATO desk. Kraemer placed Haig with Dr. Henry Kissinger in the White House, paving the way for Kissinger to "discover" Haig. The latter went on to become U.S. Secretary of State like Kissinger. Both men shared insights, included in the new book, about Kraemer mentoring them over the decades. Wrote protégé Haig, "For me, Dr. Kraemer's lifetime of service confirms the importance of the Nation's elites in pursuing and advancing the value of a free society. I can think of no individual whose patient tutelage made a more meaningful contribution to the shaping of my own worldview." Just as Kramer imparted on to Haig a legacy of values to be handed down, Haig too left a personal legacy by sponsoring an impressive hall at West Point — within the venerable institution's remarkable library, a place for all cadets to glean international knowledge. Hugh Liebert, Assistant Professor American Politics, Policy and Strategy at USMA added that the brief think-tank gathering on Kraemer provided, "quite a lot to think about regarding elitism, mentorship and U.S. grand strategy." Become an independent, strong personality like a tower of strength.Develop into a person with good character, iron will, courage and much energy. Do not only work for your career but for a good cause. Stand up for your convictions, speaking what you think and feel, and follow a code of honor. Dr. Hoffmann, inspired by Dr. Kraemer, founded the independent World Security Network Foundation as the largest elite-network for young people in foreign and defense affairs. Hoffman calls for a more efficient and fresh foreign and security policy that he labels World 3.0, which is also described in True Keeper of the Holy Flame. Explains Hoffmann of World 3.0, "It is based on the classic foreign policy World 1.0, defined by power politics as described by German-born geo-strategists Henry Kissinger and Hans J. Morgenthau. Western democracies primarily practice a purely pragmatic and populist foreign policy World 2.0 'running merely on sight' with a focus on short-term crisis management." Argues Hoffmann, "This current practice of foreign and security policy cannot adequately address the many new problems of a globalized world. Therefore we need an innovative policy World 3.0." The book based on Kraemer's insight points out the following: First, the ineffective and paralyzing bureaucratic process in the foreign, defense and development departments must be restructured. Second, bureaucracy is our main enemy, not a few radicals or al-Qaida. Third, the reactions of foreign ministries always take too long, are tentative and mostly ineffective. Missing from these ministries is the necessary in-depth planning, an assessment of that planning's virtues and regular check-ups — as is done for success in large companies. Instead, policies are dominated by endless diagnoses without effective therapies. The book also notes that international conferences, with nice television pictures but mostly unsubstantial communiqués, only reinforce this lethargy. "There is a dire need for brilliant and talented politicians," says Hoffman, "of which there are unfortunately fewer and fewer. Most political positions are not filled with the most experienced or suitable candidates, but rather selected based on inner party politics." Dr. Hoffmann made the new book available electronically to all West Point cadets in hopes of inspiring future mentoring relationships and increasing the ranks of the responsibility-elite. Brig. General Meese said that cadets had already written to him expressing enthusiasm with the session, and he thinks that what they learned will make a lasting impact. "Kraemer's mentoring lit the flame in men into a fire. He showed that through inner power, people can be better than they think."